Origin and distribution: They are a specific strain of what is generally referred to as the Ankole group of cattle. The original cattle, from which this strain is derived, were brought to western and southern Uganda by Hamitic tribes migrating from northeastern Africa and possibly the Sahel in the 13thand 14th centuries. The Kigezi cattle appear to have resulted from interbreeding of local Ankole cattle with Small Humpless Shorthorned cattle, which had inhabited this region until the first quarter of the 20th century. Consequently, their conformation differs from the general feature of the other Ankole types from the fact that they are smaller and possess shorter and finer horns than all of the ecotypes of the group (Felius 1995). Kigezi cattle are mainly found in the extreme southwestern corner of Uganda. Physical characteristics: Average adult live weight is 360 kg in bulls and 320 kg in cows and stand close to 120 cm at the withers. They are paler-coloured type than the Bahima, the other strain of the Ankole group. Horns are finer, of smaller basal girth, also usually shorter and more upright than those of the Bahima cattle (Epstein 1971). 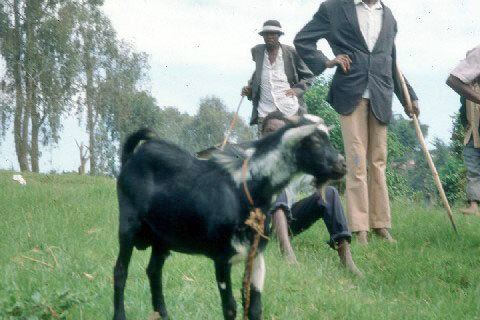 It nearly resembles the medium-horned Bashi cattle of Kivu (Mason and Maule 1960). Peculiarity: Their smaller body size, and shorter and finer horns than all of the cattle of Ankole group are their special characteristics. Breed status: These cattle are reared under three different production systems: 1. Pastoral range, transhumant, extensive grazing, in the semi-arid zone main product being milk, mainly bred pure and with a stable population trend. 2. Lowlands, stationary, extensive grazing, agro-pastoral farming system in semi-arid zone, reared to produce milk, kept in an upgrading breeding system and characterized by a decreasing population size. 3. Lowlands, stationary, fed on grazing and fodder, in agricultural farming system in semi-arid zone, reared to produce milk, kept in a upgrading breeding system with a rapidly decreasing population size (DAD-IS 2005). Utility: Milk, meat, and work. Hetzel (1988) cited in DAGRIS (2005) reported that weaning weight of calves at 9 months to be 156 kg; average live weight at 2 years was 272 kg; and calving percentage and pre-weaning mortality rate under free range condition was 72% and 19%, respectively. Lactation milk yield was estimated at 855 kg in 239 days of lactation length (DAD-IS 2005). Maule J.P. 1990. The cattle of the tropics. Centre for Tropical Veterinary Medicine, University of Edinburgh. Redwood Press Limited, Melksham, Wilts. pp. 69-70. Rege J.E.O. and Tawah C.L. 1999. The state of African cattle genetic resources II. Geographical distributions, characteristics and uses of present-day breeds and strains. FAO/UNEP Animal Genetic Resources Information Bulletin 26:1-26.